Description: Cap 5 to 15 cm across, broadly convex to flat, with an incurved margin that often has veil remnants attached to it, yellow to dingy orange with dry pink to reddish-brown flakes. Veil white to pale yellow, usually leaving ring of ragged zone on stem. Pores adnate to decurrent, large and oblong, dirty yellow, bruising red-brown. Stem 3 to 18 x 1 to 3 cm, solid, equal, yellow above veil with dry reddish-brown streaks below, cut base weakly bruising green or bluish. Flesh yellow, thick, soft, sometimes bruising pink. Veil white to pale yellow, downy, leaving line or partial ring near top of stem. Spore print brown to dull cinnamon. Habitat: Scattered to gregarious with Douglas fir and poor soil, late fall to mid-winter. Primary Keys: Yellow cap with brownish fibrils, yellow flesh, yellow pores bruising brown, yellow stem with brownish fibrils below ring, cut base staining bluish-green. Edibility: Mediocre, unless dried. Some people may have lower GI issues unless the cuticle is peeled off. 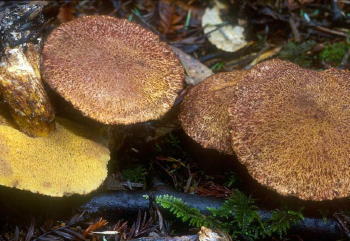 Notes: This Suillus is our second most common species and is associated with Douglas fir, in poor exposed soils. Our most common lawn-loving cousin — Suillus caerulescens (Douglas fir Suillus) — may be streaked on the cap, but doesn’t have fibrils on the cap or stem, and is darker on top. Both can be used, if you make sure to gather young, firm specimens that are relatively maggot-free. Both are so abundant that even if they’re not a choice edible, they are worth harvesting for drying and/or making mushroom powder. Toss Suillus slices with the salt, white pepper and oil. Bake on cookie sheet in 275 F oven for 1 hour, or until lightly browned and crisp. Crush roughly to make mushroom chip crumbles. Saute chopped mushroom, onion, carrot and celery in butter until tender and translucent. Sprinkle in flour, stir, and saute another few minutes. Add stock, salt and pepper, bring to a simmer, and cook for 5 to 10 minutes. Remove from heat and carefully blend smooth. Add cream and dill, and heat through without simmering. Serve in four bowls, topping each with 1/4 of the mushroom chips, and a sprig of dill.